btw is this ITA substitute if set to max 0.5ms? 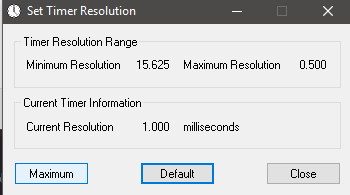 The default platform timer resolution is 15.6 ms (15625000 ns) and should be used whenever the system is idle. If the timer resolution is increased, processor power management technologies may not be effective. The timer resolution may be increased due to multimedia playback or graphical animations. The stack of modules responsible for the lowest platform timer setting in this process. I mean the timer you were talking few times, well this app can set to max instead of default windows - Usually 1ms.. But only one game in my library was cured from stuttering by setting maximum timer resolution. So I don`t need it permanently. Seems the Windows updates for this have been updated again, should cover more CPU models now since it even popped up on Windows Update here. Bit of weirdness going on for me on 1607. kb4346087 bundled version C6 for my skylake CPU but I now have a KB4091664 reverting it back to C2 (which is also loaded in my bios). I had RS5 installed in a bootable VHD for a couple of days and it was C2 there too. I had expected it to be bundled with the latest microcode. Guys, I got a stupid question for you, if my update history says I already installed KB4091664 on August 2nd, I should still upgrade this, right? If your CPU is listed, then I guess yes would be the answer if you want the latest micro-code. WU should update if you need it though, might take a week to get to you. There was such KB with microcode updates which was updated after initial publishing. So yes, you should (either automatically or manually). Thanks guys, yesterday when shutting down he queued the update automatically anyway before I could bother to download. I've got the update pushed on my PC as well even though my CPU isn't even listed in the KB article. Seems like MS is just pushing it out for everyone now. I just got it too, but I had to manually check, didn't auto update this morning. I am on 3570k too. You can download latest microcode cpu106E5_plat13_ver0000000A_2018-05-08 PRD_B16FCEEB.bin for that CPU from here and use UBU tool or hex editor and add to bios. which is why I was hoping Microsoft would put the Lynfield microcode updates on Windows update. It doesn't seem like they want to though. You can ask nice people in UBU thread to mod the BIOS of your motherboard for you. In early 2018, security researchers discovered several security vulnerabilities affecting all processors: Meltdown and Spectre. These vulnerabilities allow speculative execution side-channel attacks (CVE-2017-5715, CVE-2017-5753, CVE-2017-5754). While Meltdown was resolved with an OS patch, Spectre required a microcode update. Since the microcode is stored and automatically loaded by the BIOS/UEFI, motherboard manufacturers required to issue an update. However, manufacturers normally release firmware updates only for their newest products. Plenty of motherboards still remain vulnerable until this very day. Intel Microcode Boot Loader is a workaround for the microcode problem on Intel-based motherboards. It updates the microcode every time the system is booted. Based on Intel BIOS Implementation Test Suite (BITS), users no longer need to modify BIOS/UEFI ROMs to stay protected from security vulnerabilities, bugs and erratas. This solution requires permanently plugged USB flash drive with at least 25MB (or similar device) and BIOS/UEFI supporting boot from USB devices. 1. Format a USB flash drive with FAT32 filesystem. 2. Extract the archive to the USB flash drive and run install.exe to make it bootable. 3. Enter the BIOS/UEFI, assign the USB flash drive as the 1st boot device and enable legacy boot mode. 4. The boot loader will regularly update the microcode and load the OS. * This release includes the latest ucodes for 392 Intel CPUs produced from 1996 to 2018. * The ucodes are stored in the \boot\mcudb folder if you wish to update in the future. * If you get 'Ucode not found' warning during installation, or plan to deploy on another PC, look for the correct ucode (by CPUID) in \boot\mcudb and copy it to \boot\mcu. Also, who or what is "NGOHQ"? Also, i didnt find it anywhere, would i be able to use this with my Q9550 CPU? But other then that a good alternative for older systems..
No, thank you. I will prefer to modify BIOS or wait for WindowsUpdate KB with updated microcode. ok, so its not good? The1 and BetA like this. The following table lists specific Microsoft Knowledge Base articles by Windows version. The article contains links to the available Intel microcode updates by CPU. We will offer additional Intel-validated microcode updates for Windows as they become available to Microsoft, and update these articles accordingly.